Although Woodlawn has religious elements throughout, there are greater themes at work here too; those of non-segregation, love, and family, to name some. Thanks to these accessible themes, even non-religious moviegoers can enjoy this film, which is not always the case with Christian films; I enjoyed this movie as well, and I am not religious. Woodlawn is the true story of Tony Nathan (Caleb Castille), a football player in the early 1970s in Birmingham, Alabama, who plays on a high school team that's comprised of 95% white players. Woodlawn High School itself has only just recently become integrated, against the governor's wishes, and the African-American students are not treated very nicely by their peers; even the black football players have trouble fitting in with their white teammates. A "motivational speaker" (as the coach calls him initially) named Hank (Sean Astin) shows up one day, and soon enough, most of the players on the team start believing in Jesus and in equality; this eases tensions among the players, and they start playing like an actual team. Coach Gerelds (Nic Bishop, Covert Affairs) isn't sure what to make of this at first, but he likes the changes he's seeing in his team, and soon he decides to get baptized and become more religious as well. There was a 15-minute or so clip that aired before the movie featuring Jon Erwin, the co-director and writer, and I found his vision interesting (click here to see the clip). He wants to make Woodlawn one of the first Christian blockbuster movies; apparently only approximately 31 movies each year in the United States are blockbusters, meaning that they make $150M or more. Woodlawn has a much larger budget than other religious movies, which I could tell based on the A-list cast: Sean Astin, as the "motivational speaker" (actually more of a preacher of sorts); Jon Voight as the University of Alabama coach, who wants to recruit Tony; C. Thomas Howell as an opposing team's coach; and a few others. Newcomer Caleb Castille was also great as Tony, and apparently he only had three days to prepare for the role. Yes, see this movie, though the version we saw is going to go through more changes before releasing in theaters; we were told about this ahead of time, and it was actually pretty interesting to see what edits they're going to make (ie: on big game scenes, there were no people in the stands; the end of the movie had a green screen in one scene; there were voice-over subtitles but no voice-overs yet; etc.). The two standouts in the movie for me were Nic Bishop as the coach, and Caleb Castille as Tony, and it surprised me to learn that this was Castille's first movie; he's very good in the role. 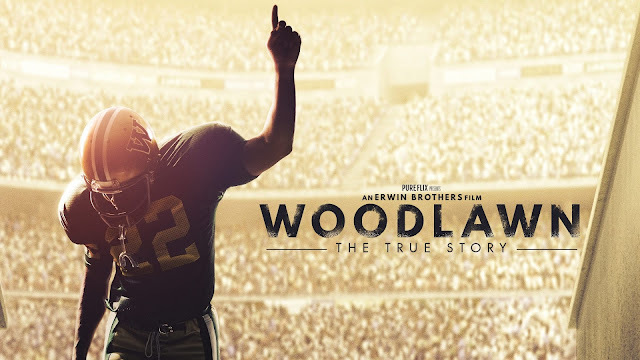 I'd compare Woodlawn to When The Game Stands Tall, although I liked that film a little more than this one, and I liked that this movie was based on a true story - stay through the end to find out what happened to the real people from the movie, too. Woodlawn will be in select theaters in the metro Detroit area, MJR Troy (where the screening was) being one of them, and I'd recommend seeing it if you like football movies; if you like religious movies, it's an added bonus, too. Woodlawn is in theaters today, October 16th, and is rated PG with a runtime of approximately 120 minutes. 3.5 stars out of 5.